Deep fry artichokes in oil (I used olive oil) until kind of crispy on the edges (You don’t have to thaw them first). Dry artichokes on paper towels and then salt them. Garnish with crunchy sea salt on top. (I used canned whole artichokes in water. DO NOT use the marinated artichokes that come in a jar. Fleur de sel or sea salt or kosher salt. Not regular table salt. Add the artichokes to the hot oil in a single layer. Deep fry until crispy on the edges. I used 2skillets so you will need to fry in batches if you only have one. Drain well on paper towels. Arrange artichokes on a platter. Top with hunks of burrata. Add the chiffonade cut basil. Drizzle with your best extra virgin olive oil. Sprinkle sea salt to taste. Fresh ground pepper to taste. Note: Aaron called for the artichokes on top of the burrata. I put the burrata on top of the artichokes. It looks better IMHO. Note 2: You could easily add a drizzle of balsamic too but I did not. Good friends like Charlie and Laurie are hard to come by, so we consider ourselves twice blessed to have them as neighbors too! Our friendship began in 1983 when we purchased our homes whose back yards are diagonally across from one another. We are only separated by a small path that I hope will never be closed as long as we both shall live. As our new mortgages began, so did living on tight budgets. My two children did not have a swing/play set in our yard but Laurie and Charlie’s yard, had one of those huge wooden play gyms. With persistent persuasion I convinced my son to go down to Laurie and Charlie’s yard and meet their children and possibly be invited to use their play set. It worked and my children enjoyed their play gym for years. With a house that is situated on a cul-de-sac street, Laurie and Charlie’s street was perfect for our mutual children’s sports and games, unlike my busy street. All of their children are grown and so have ours, and the play set is gone from their yard, but Laurie, Charlie, Tom and I still get together as often as we can, whether with a group of friends or just the four of us. During our marriages Tom and Charlie cooked on occasion, also did most of the grilling. Laurie and I basically prepared the weekly meals and all the holiday dinners while raising our families. Somewhere along the line, our roles switched. As our children got older and more independent, the moms moved away from the kitchen and the husbands moved in. My husband now usually prepares dinner every week night and I cook more on the weekends. Along the way, Charlie got very into wines. He built a wine cellar in his house and start exploring the pairing of foods with certain wines. He gradually progressed into cooking at a more advance level. Now there is no stopping him! I bought my husband one year an espresso 2 tier old fashion coffee pot for use on the stove. Charlie got himself a commercial equivalent huge espresso machine. I remember one occasion when I was at their home for a meal and was generously pouring balsamic vinegar over my salad, only to hear that it was very good aged Italian balsamic vinegar that cost around $40.00 a bottle. My balsamic vinegar comes in a 2 pack from Costco and is very economical. Tom and I get to enjoy being treated to delicious meals at their home all the time. The first time Charlie prepared this artichoke dish was for a group of us at his home on New Year’s Eve. Everyone loved it. Charlie used his son, Aaron’s, recipe that evening. Charlie again made it was for me when he and Laurie came to our house for an intimate dinner with just the four of us. Charlie made it a bit different, but I didn’t’ notice since it was still amazing. When I asked for the recipe and if I could put it on “Somebody’s Mom”, Charlie was very enthusiastic. As I was reading his recipe, I came across the cooking term chiffonade cut. While I assumed it had to do with cutting the basil leaves, I still had to look it up. Charlie you are definitely above and beyond me with culinary skills and I want you to know how much I appreciate and respect it. Charlie your are a neighbor, friend and chef all rolled it to one! We support you in all your cooking adventures and are literally right behind you reaping all the benefits! Bread cutlets and place a slice of mozzarella on cutlet and roll it. In a pan saute tsp of garlic and 3/4 stick of butter. Add can of chicken broth and cook for 5 minutes. 1. Slice chicken breasts very thin, try to get 3 cutlets out of one large breast. 2. 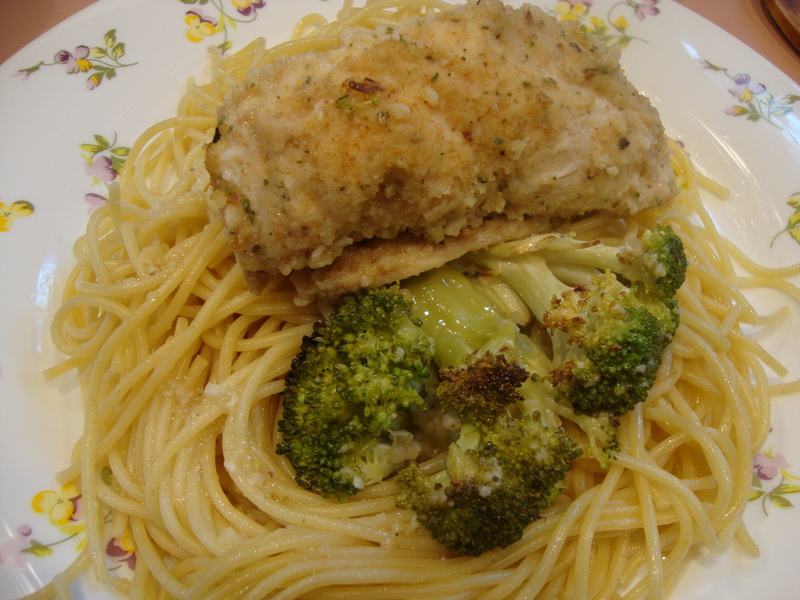 Dredge chicken cutlets in egg and then bread crumbs, set aside. into a 9 x 13 pan to fit tightly. 5. Oven to 400 degrees. garlic tender, add chicken broth and cook 5 minutes longer or until heated through. 7. 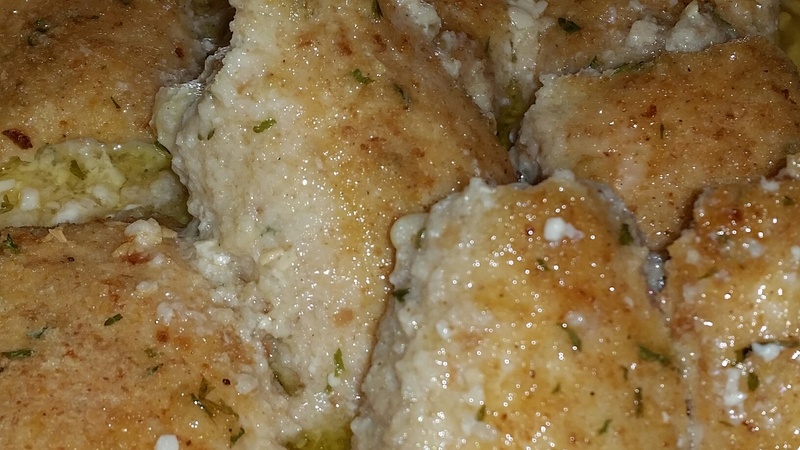 Pour garlic chicken broth mixture over cutlets in pan. 8. Cover with foil and bake for 40 – 45 minutes. Uncover and continue to cook 15 minutes more. 9. Serve immediately, over pasta or on the side. Serves 8. 10. ENJOY – Chicken and cheese – please! We met my husband’s cousin, Ricky, and his wife, Lorraine, way back in the day when Tom and I got married over 30 years ago. Lorraine, Ricky, and their daughter, Melissa, lived together in a two family house in Rockland County with Lorraine’s parents. I always envied and admired their lifestyle; it was all about family. They lived side by side, sharing meals and laughter, all reminiscent of my own childhood in a two family house with my aunt, uncle, cousins, and grandmother. When Tom and I visited, we would join her mom’s dinner table, seated amongst several generations of family. Fast forward to the present, and the family ties and traditions still hold fast. Lorraine and Ricky now live in a two family house with their daughters, Jennifer, and Amanda and her family. We recently celebrated their granddaughter, Savannah’s, first birthday party with them, and shared a meal and laughter with their extended family. The birthday party was in the backyard, and home cooked dishes were served, including this recipe from Lorraine. The envy and admiration of this close knit family living arrangement still tugs at my heartstrings. To have your children and grandchildren living in the same house together is a very special blessing. Lorraine is a cook’s cook. Some of the best cooks I know don’t always have a recipe in front of them. They are artists! I believe that you can take liberties with anyone’s recipe and make it your own to suite you/your family’s specific tastes, all without insulting a good cook such as Lorraine. When I prepared her chicken dish, I cut the butter amount to 4 tablespoons, instead of her suggestion of 6 tablespoons, but then I felt her chicken was juicer and mine could have been a bit more moist, but it was still delicious. In retrospect, I should have paid more attention to Lorraine’s recipe in the first place when it came to the butter, and I will the next time I prepare it. As far as the jarred garlic was concerned, I questioned using it rather than using fresh garlic. Lorraine said she only uses the jarred garlic for this recipe, and fresh garlic for everything else. Go figure…..but that was a good enough answer for me, and jarred garlic it is. Looking forward to the next family gathering and some home cooking at Ricky and Lorraine’s…..BIG HINT if you are reading this, Lorraine)! 2. Combine all ingredients in a medium bowl. Mix well. 3. Spread Swiss cheese mixture into a 9-inch pie plate or baking dish. 4. Bake 8 minutes. Stir. Bake for 8 more minutes. Serve hot with crackers, chips or cut carrots and celery. 5. ENJOY – Almondy Swiss goodness!